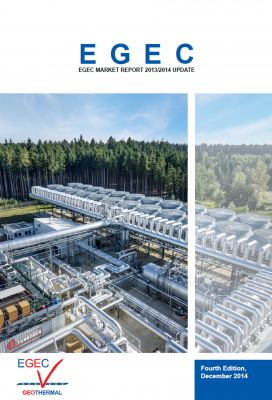 In this edition, geothermal district heating continues to show dynamic development in Europe, with eight new systems having an installed capacity of 76.2 MWth, becoming operational in 2014, and 204 projects now under development- 10 more projects than last year. The total installed capacity in from the 247 plants in Europe is now 4.5 GWth. 162 of these plants are in the European Union, producing 4256 GWh. Political changes will continue to drive the development of the geothermal district heat sector, as governments increasingly look for energy supplies which are local, secure and steady- demands met by geothermal. This is particularly notable in Central and Eastern Europe areas with extremely good potential- although the potential right across the continent is being increasingly recognised. Issues such as lack or appropriate financing models and unfair competition with fossil fuels have held back the sectors development in the past, but these barriers are increasingly being removed. “Whilst Central and Eastern Europe will see rapid progress, we can also expect to see interest in areas where potential has not been fully recognised in the past” said Philippe Dumas, Secretary General of EGEC. The power sector also continued to grow, but at a much slower pace than is possible. Eight new plants came online in 2014, with a newly installed capacity of 170 MWe. There are now 77 power plants in Europe, representing a total installed capacity of 2 GWe. 51 of these plants, with a total installed capacity of 950 MWe are in the EU-28, producing 5.56 TWh annually. The fast development of the Turkish market, and the 128 projects currently being explored will be key in the expected growth from a European installed capacity of ca. 2 GWe in 2014 to ca. 3.5GWe in 2018. The development of the shallow marked is steady, although it is still underperforming given the potential. Sweden, Germany , France and Switzerland continue to be the main players, accounting for 64% of the market, although high growth rates can be seen in Italy, Poland and the Czech Republic. The shallow market faces a number of challenges. Lack of awareness about the advantages of the technology persists. Regulated gas prices, a lack of a level playing field in the heat market and low renovation and construction rates remain problems for the sector. With better understanding of how these barriers can be overcome, improved legislative frameworks and by the greater inclusion of shallow geothermal systems in regional and local planning, the market should show stronger growth. The full version is available to EGEC members in the reserved area.